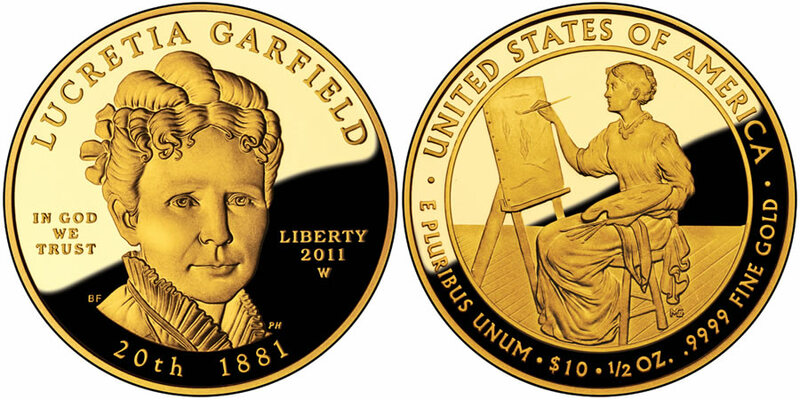 The Lucretia Garfield First Spouse Gold Coin will appear as the final of four 2011-dated strikes in the program. The coin also marks the twenty-first since the program debuted in 2007 honoring the spouses of the former Presidents of the United States. In the case of this coin, it honors Lucretia Garfield, wife of James A. Garfield the 20th President of the United States. Not much can be said about Lucretia's service as First Lady owing to two factors. The first is that she contracted malaria shortly after her husband assumed office and was moved to New Jersey to recover. While still recuperating, her husband James was shot and he passed away after having only been President for 200 days. Still, Lucretia did have plans and had researched the history of the White House with the intent to restore its furnishings to their former glory. The United States Mint will strike two versions of this coin - the Lucretia Garfield First Spouse Gold Proof Coin and a Lucretia Garfield First Spouse Gold Uncirculated Coin. The coins will be identical except for the finish of the coin. "LUCRETIA GARFIELD, " "IN GOD WE TRUST", "LIBERTY", "2011", "20th" and "1881" will be included on the obverse of the coin along with a portrait of the former First Lady. Lucretia is shown on the reverse of the coin painting which is indicative of her love of art. The reverse also has the inscriptions of "UNITED STATES OF AMERICA", "E PLURIBUS UNUM", "$10", "1/2 OZ. ", and ".9999 PURE GOLD.